I am very grateful for the winter we've had so far. We have about a foot and a half ground cover of snow and on the trails it is well packed, enabling me to be able to walk on them with boots and no snowshoes. As the sun came out and the temperatures warmed to about -3C after lunch today, the trail and my friends the chickadees were calling to me. While my loaf of honey whole wheat bread was rising, I went for a stroll. It turned out beautifully although I did leave it a little too long to raise while I was out. I walked the same part of the trail I usually frequent taking pictures of many of the same things only from a different angle and different sunlight. Do you notice how their lines lead you into the trail? I had to stop right here and take a moment to feel the sun on my face and to breathe deeply. And of course I took a few moments to share some seed with my fuzzy little friends. Today, the textures on the birch trees caught my eye. The lacy dried seed heads of the dogwood are so pretty against the reds and greys. I love the little raised dots on these branches. There is an infinite number of things to see and wonder at if one takes the time to really look. 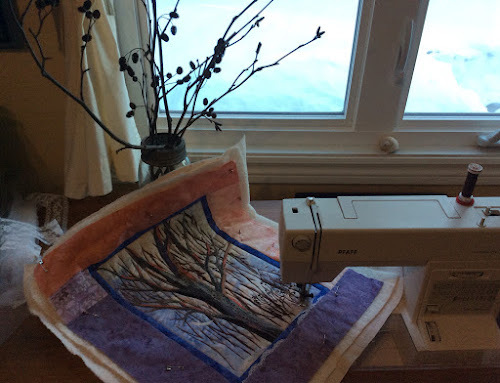 I'll not even begin to use half of it in my work but it is all there for reference and may come out one day in a piece, such as the tree I'm working on now where I added the alder bushes in the forefront after my walk. 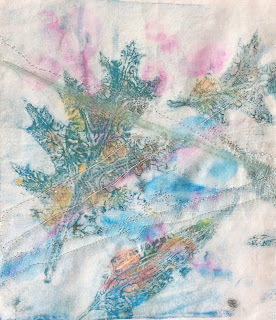 All that remains are a few details, maybe a snowflake or two and to quilt the borders. I added Hollowshimmer thread to many of the branches today but try as I might, I could not pick up the sparkle in the photo. 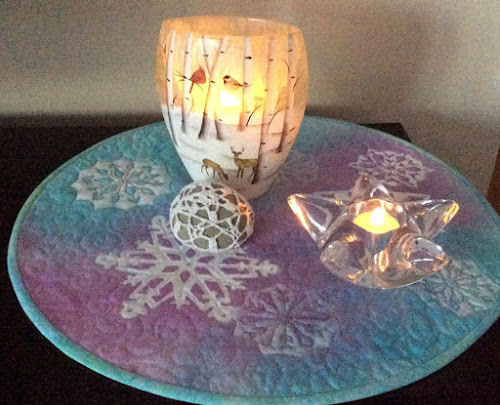 With the same Hollowshimmer thread, I added some stitching and a small piece of Angelina fiber to the Leaves Under Ice piece. It measures about 6 by 8 inches and is meant to be a donation. I'm not sure if it works or not. It is time now for me to put my feet up for a bit before I start supper--sole done in a squash cottage cheese sauce. 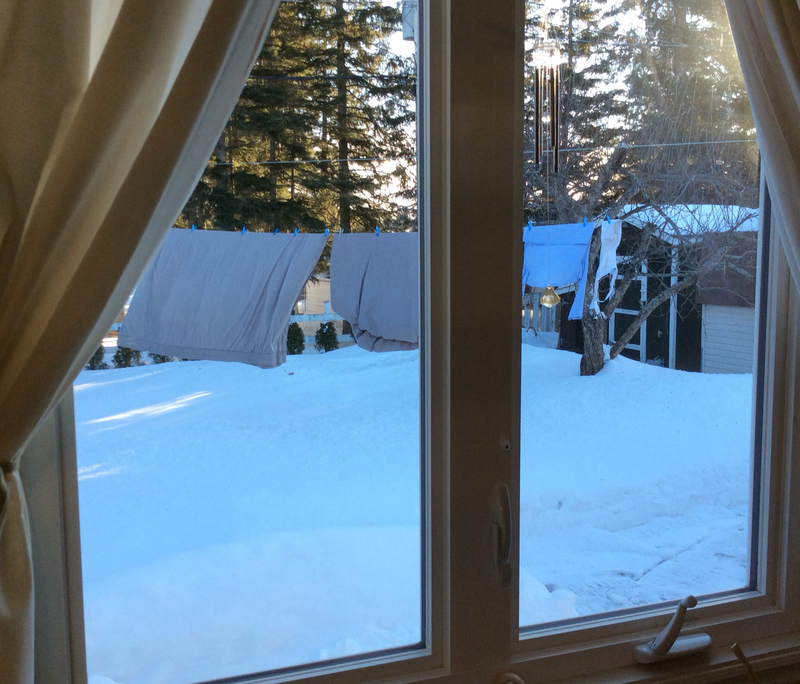 The weekend was beautiful and sunny and continued into today, even warming up to about -3C. 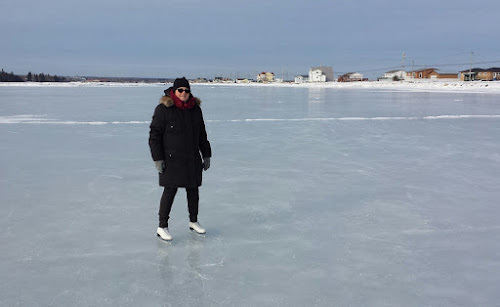 Yesterday, I actually put on my skates for the first time in a few years! The ice on the lagoon at the beach is about a foot thick and pretty smooth. Thanks to little snow so far this year, it makes for good skating. I was pretty shaky and unbalanced at first but did manage to puty around for a while as hubby went back and forth. 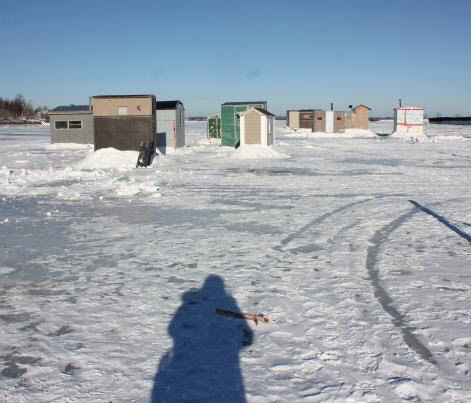 It's smelt fishing time on the ice again and I love getting out to photograph the shanties. They're not quite as colourful this year, hoping there'll be more. I've been a bit taken with my shadow lately. Maybe it's something to do with how 'removed ' from life I've been feeling. It seems to affirm my existence and confirm to me that I'm improving little by little and getting out there. I enjoy sketching the shanties and will probably do another fiber piece featuring them. 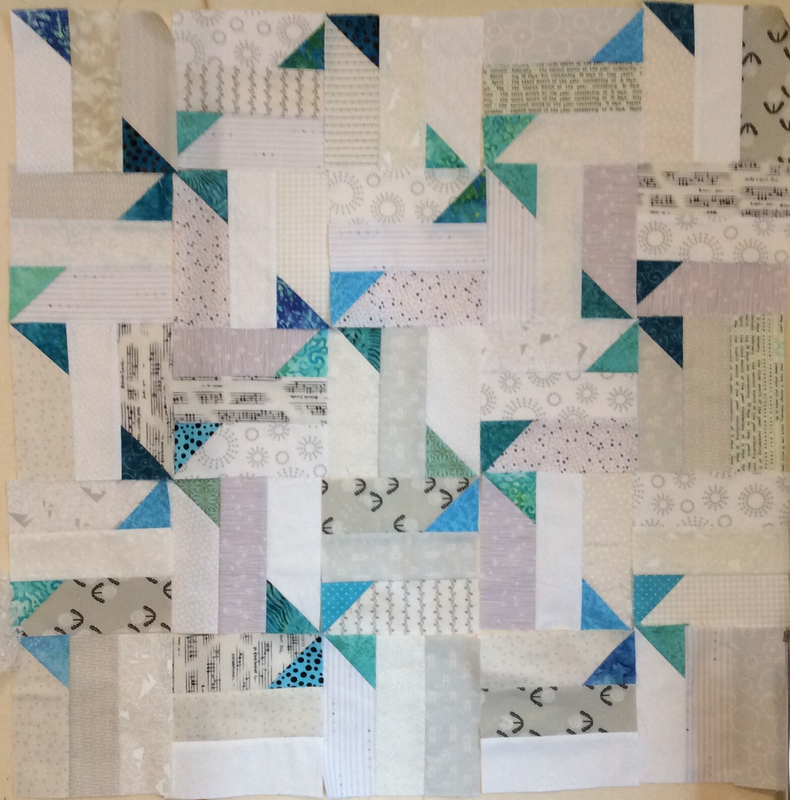 I had a few errands to do today and so just had time to get most of the blocks done for the baby quilt. 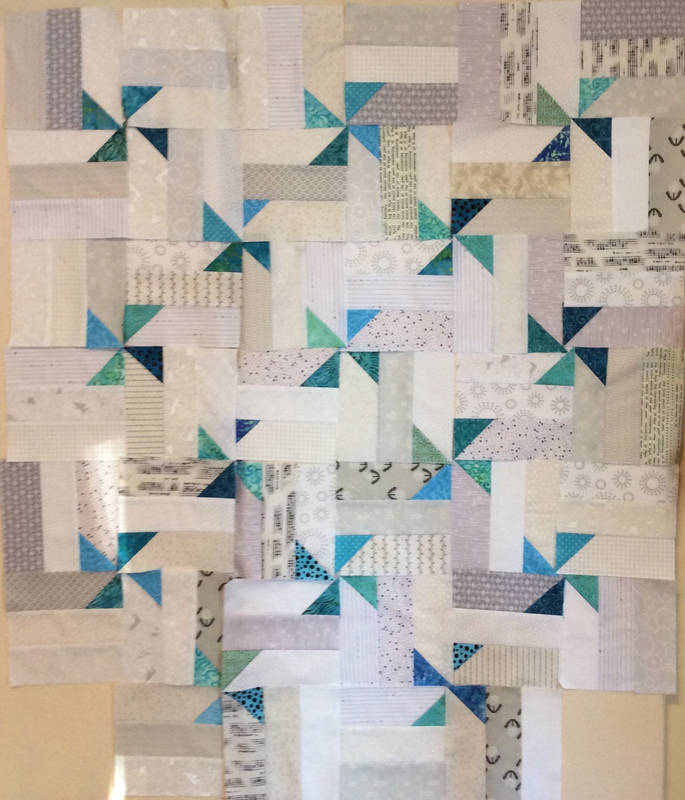 I have two blocks left on the bottom corners; they're thrown up in random order. It will come down so I can trim the blocks before arranging them and putting it together. Next, I have to do another one. Since I need it sooner and it's all cut, I will start it later this week. Tomorrow I'm off to another doctor's appointment in Moncton. I'm also going to the pain clinic. Looking forward to that. 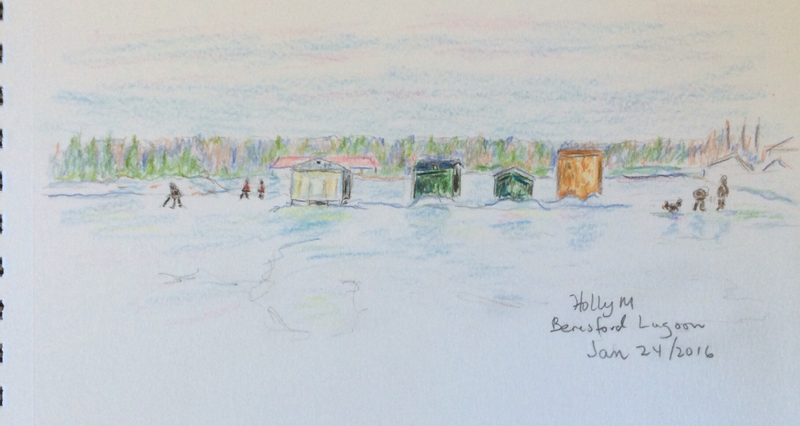 It is the perfect kind of winter day-- cool, but sunny with no wind. 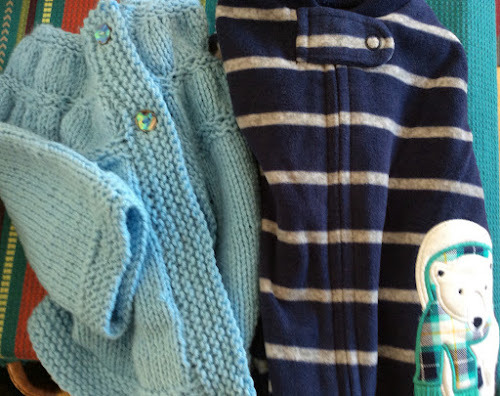 I went out this morning to do a couple of errands and to make a little walk downtown to the yarn shop and to an antique shop with a friend. A bit of fresh air, some chat, and a wee bit of exercise. Of course we each came back with some sock yarn to add to the stash. 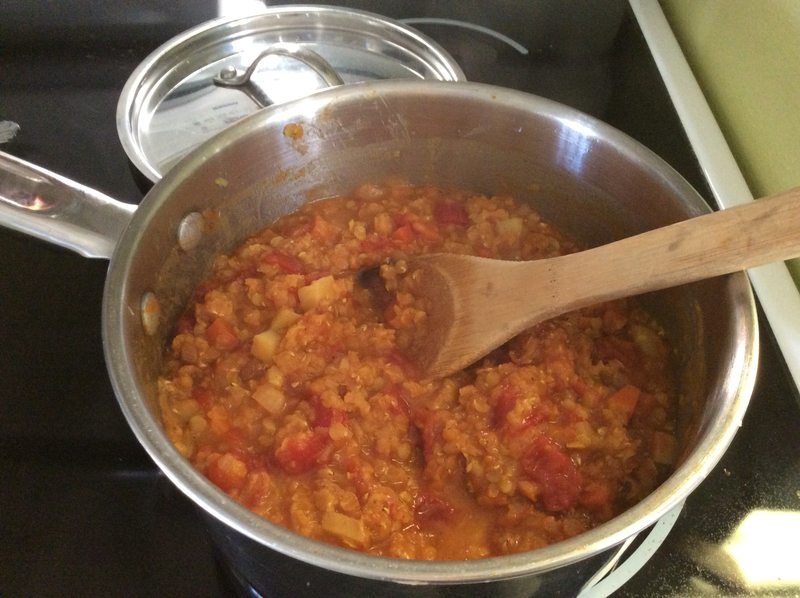 At lunch I got a pot of Morocan lentil soup going. Lots of yummy spices went into it: cinnamon, cumin, allspice, coriander and paprika. 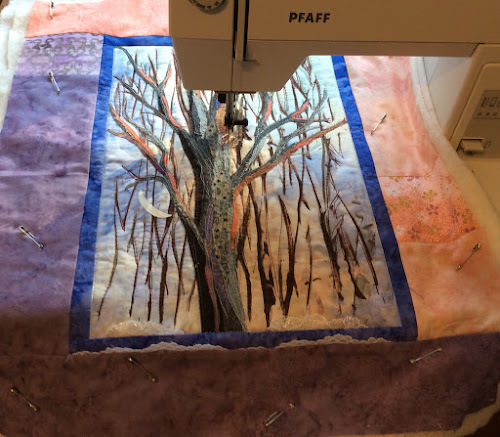 The afternoon was left to head into the sunny studio where I started machine quilting the tree to some classical piano that I brought up on the I Pad. It was so relaxing that I kept going. The bright view through the window and the music kept my hands moving. Next time I hope to add some sparkly frosty highlights and a few snowflakes. 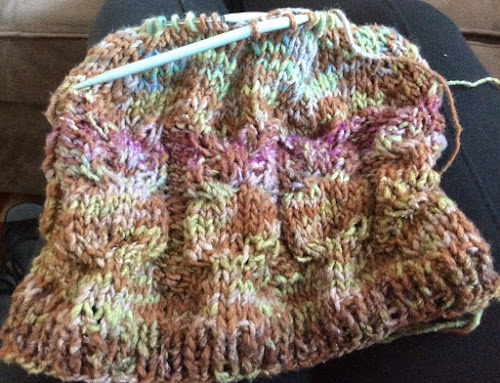 My latest knitting endeavour is another owl hat in a variegated Noro yarn, this time for me. The buttons will help to define the owls. The only thing I need to do is take it back to where I started the decrease as I think I need a few more rows to add to the length. I did this baby sweater a while ago. It's going to get mailed off Wednesday as a gift to a nephew's first born. 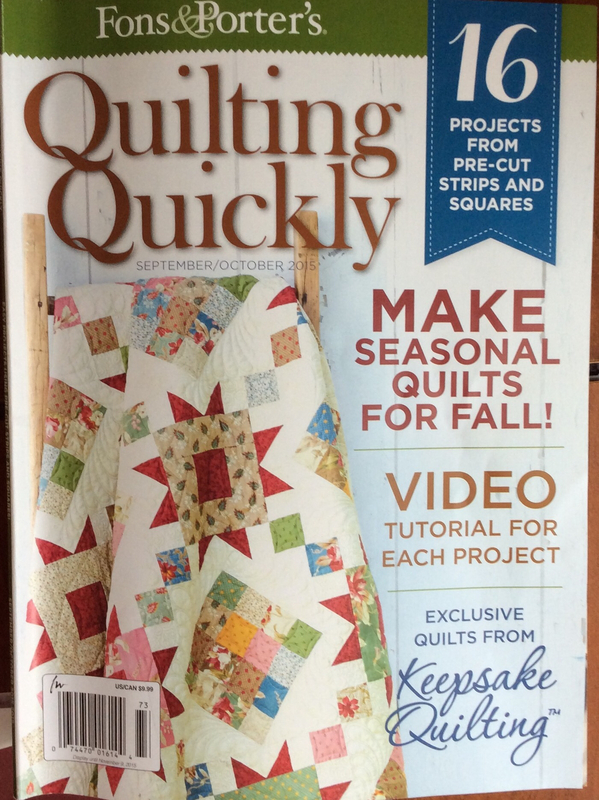 I need to replenish the stock and get going on baby quilts too. 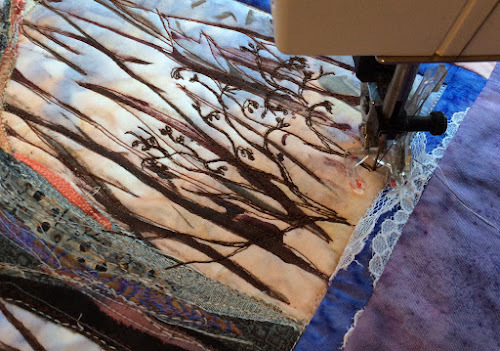 I could have gotten a little more sewing done today, but when the trail beckons and I think I can walk, I have to go. 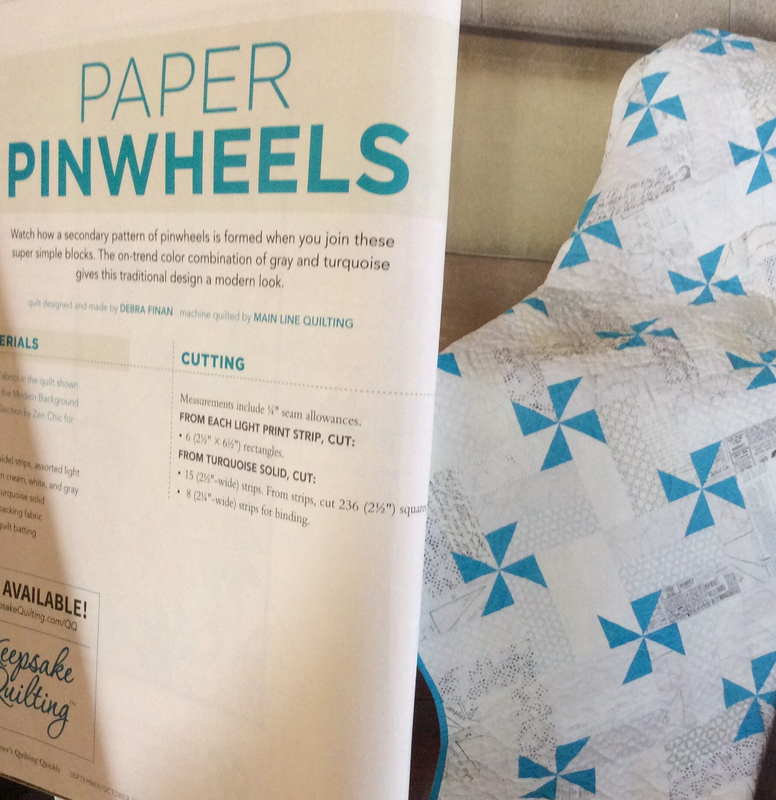 This morning, I sewed a few more blocks for the baby pinwheels and then I took a friend for lunch. It was so nice out. As it's been a while since we had a fresh snow, I knew that the trails would be packed down now I thought it was the perfect time to take the camera and walk in a few hundred meters. Just far enough to feed the chickadees and feel really in the country. I'd like to sketch this sometime. I've been dreaming of a time when I could get out again and this says I am here; I am alive! I'm trying to follow my friend's advice and live for today, forget about what could be to come and what my limitations will be. Today, I walked into the woods and breathed wild air. I walked at turtle speed; perfect since i chose turtle as my totem for the year. Dried seed heads are so pretty etched against the sparkly white snow. Here are my favourite 'pom poms' against the winter greyed trees in the background. In spring, I'm going to have to venture in and find out what this bush is called. 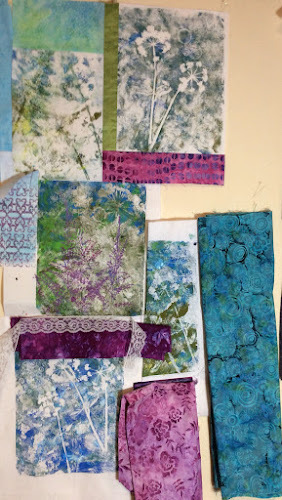 And later this afternoon for a little creative play, I experimented with a Gelli leaf print. I'm attempting to make the leaves look as if they're frozen into ice. 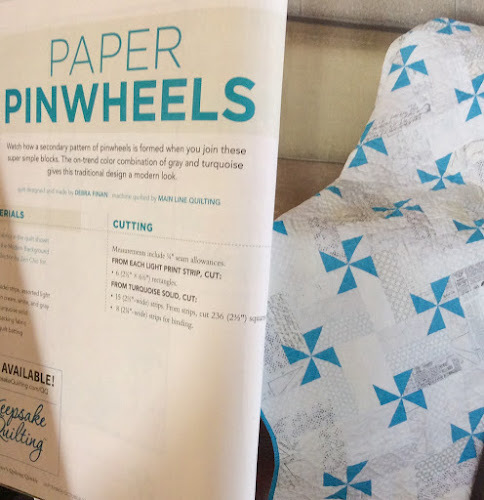 I went to bed last night intending to get up and try to do my kitchen floor but after a painful night, I deciced I needed to go out and look for a new mattress. It's such an effort to go try them all out. At least I've narrowed it down to a couple. It is such a beautiful sunny day today that my studio is a happy place, especially with my view through my window. Oh how I love looking at that line of bed linens! I've just put been puttering a bit. I'm anxious to get to the quilting and embellishing part on my tree and I did get the third border on top and cut the bottom one. I'm going to sew in a bit of lace too. 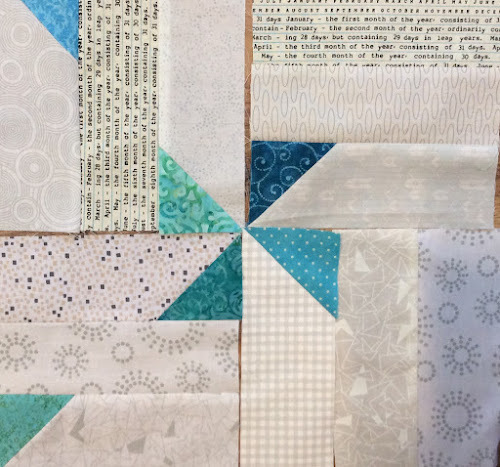 I reluctantly put t aside and switched to the baby quilt because I just learned that I'll need another one, so I need to concentrate on some block sewing for a while. 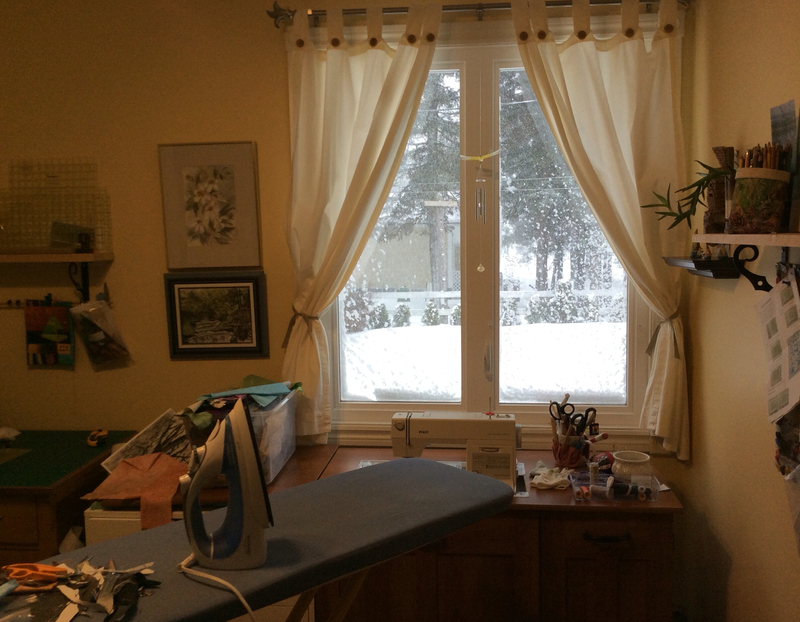 The view in my studio is a little darker today with the blowing snow outside. I was slow getting going this morning lolling about with tea and a crossword, but I've been making up got it since. I finished the last bit of vacuuming, put in a wash, and put chicken bones on to simmer. I'll make soup for tomorrow nights supper in case my husband is headed home. Just before lunch, I put together a few more pieces for the baby quilt. I put in a strip of grey with the black and white dandelions to see if it will work. I think so. 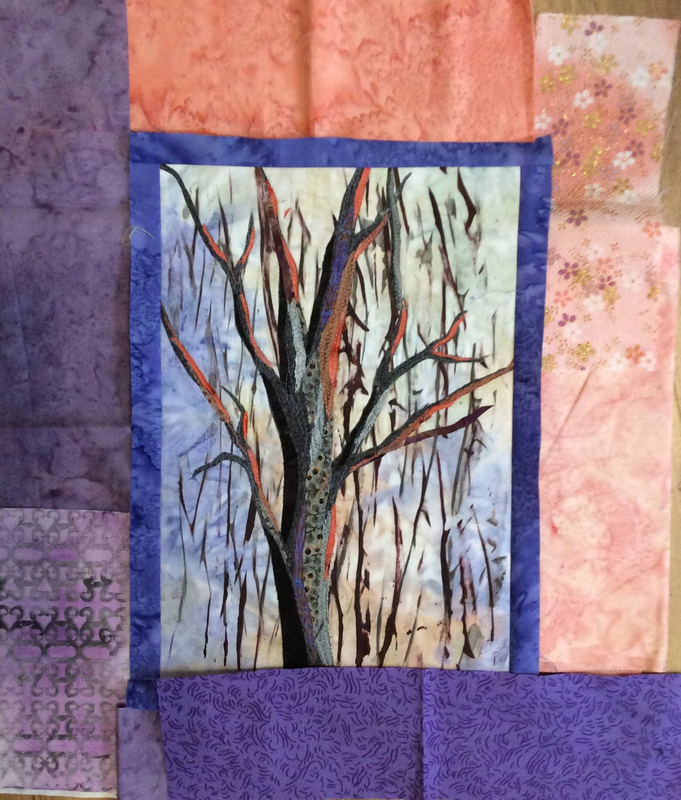 Since lunch, I've been working on the borders for the tree. The sides are on. I'm still thinking about the top and bottom. 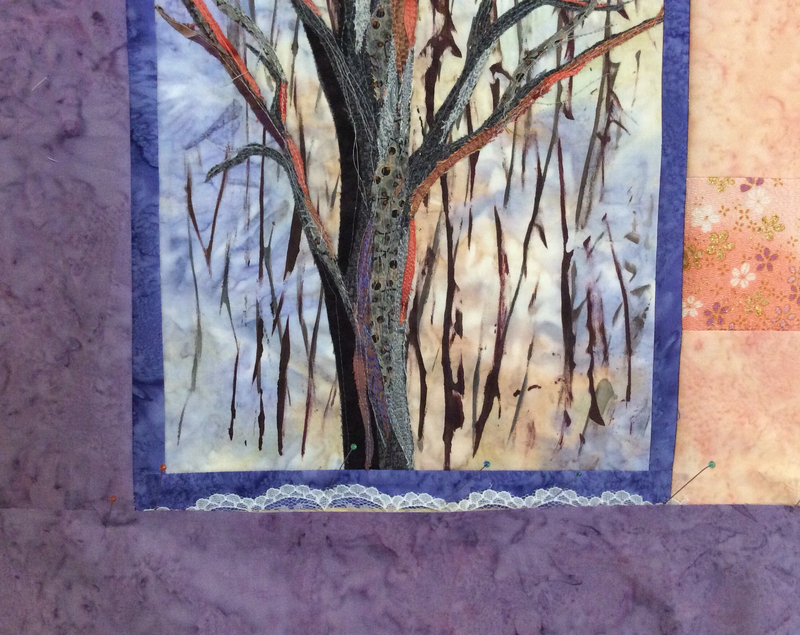 I have a few more things to add, like some thin shrubs at the forefront, maybe a bit of lace and some white sparkly thread for frosty highlights. 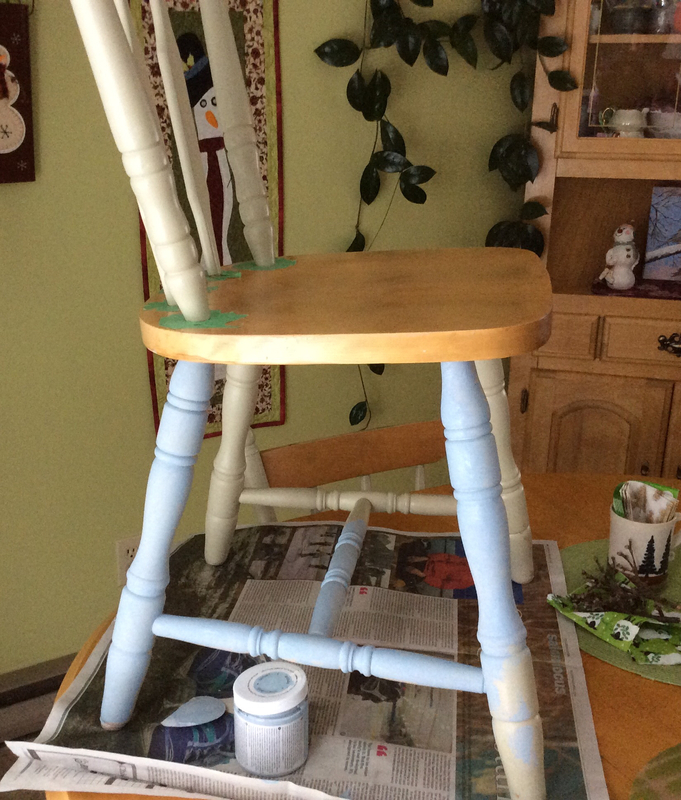 I also took a few minutes to try out some chalk paint on a kitchen chair. It really does apply beautifully and all you need to do for prep is clean. I think though, that I may go back to an off white. Not sure yet. Well, I'm going now to make tea and take a break. I can't help it! I'm trying to work on one project- yes the tree from last post- when the Gelli printed Queen Anne's lace keeps popping into my head. 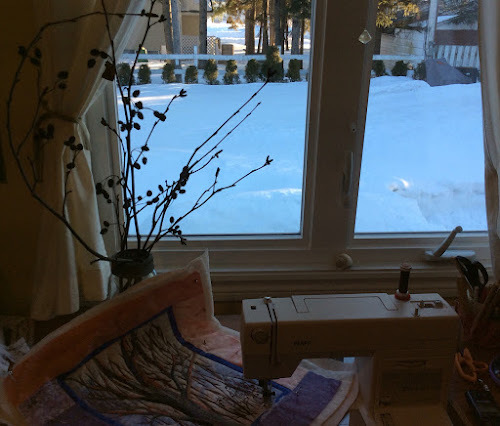 I figure that I should take advantage of any and all creative inspiration and absorption right now, so I went for it while at the same time cutting and auditioning fabric borders for my tree. The small section at the top with the strip of green silk is stitched together. I kind of wanted to try a raw edged method this time. I love the look but have always had a hard time to loosen up enough to do it. The prints with the paint would not fray easily, however I wanted to add a silk strip and it really frays so I pieced it. I'm still trying to figure out if I could do some raw edges on the piece. I think I'll take it to my quilting group tomorrow and see what they say, bearing in mind that they are mostly more traditional quilters. There's a bit of creativity lurking there though. Since I don't want to lug a machine, basically can't do it, I will bring some hand stitching and a bit of cutting for the baby quilt, also shown in the last post. 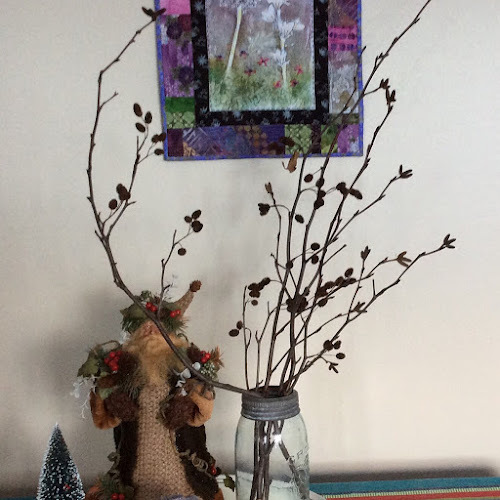 A friend stopped by today with some branches that she picked off the trail we would take while snow shoeing. I'm gradually getting over my envy over getting out there and looking forward to a time when I may be able to go for a short one. In the meantime are these not beautiful? We tagged it the Pom Pom bush as that's how they look from a distance. This is a little view of my studio while I'm putting together a piece. Just to show that I can get a bit messy. Once the piece is together and ready for stitching and embellishing the fabric will be folded and stored away. Then it'll be time for free motion stitching and maybe time to pull out the fiber collection for embellishing. I'm appreciating that the January days are slowly lengthening. My string of deck lights which are set to cone on at dusk are lighting up a bit later each night. I'm on my own this week, eating and cleaning when I feel like it. Walking into my sewing studio when the mood hits. There'll be some reading, some jigsaw piecing on the I Pad (I'm addicted! ), and some knitting. No schedule and no cooking! I'm slowly becoming more positive again, learning to rest when I need it. When I can stop fighting my current limitations and listen to my body, I'll have less pain at night and therefore a better sleep and a better attitude the next day. Well, that's the plan. Happy Monday! I'm hoping you've done something nice for yourself today. It seems that the word that popped into my head on New Year's Day, acceptance, is going to be a challenge. As one blogger wrote to me said, who coincidentally chose the same word, that some say it is the way to inner happiness. This week, at my follow up appointment for my knee surgery, I was told that my knee is worse than he thought by the pics. I may have two years before needing a replacement. He also ordered a hip replacement . The waiting time is about 18 months. I'm glad to be finally getting somewhere but at the same time it's a bit of bad news for me. He told me that snowshoeing would be out after a hip replacement. I've always been very outdoorsy, so it will certainly mean I won't be able to do some things. At the moment, I'm in the middle of a grieving process, at the same time trying to function with increasing pain. I will need to work on the acceptance part and hopefully, I'll eventually find my way to some inner peace. I know this probably sounds very whiny to some. There after all many worse things and I must always keep that in mind. Good news though. I will see the back surgeon in two weeks and the pain clinic at the same time. I am lucky to have gotten in. It can often be years. So, enough of that. 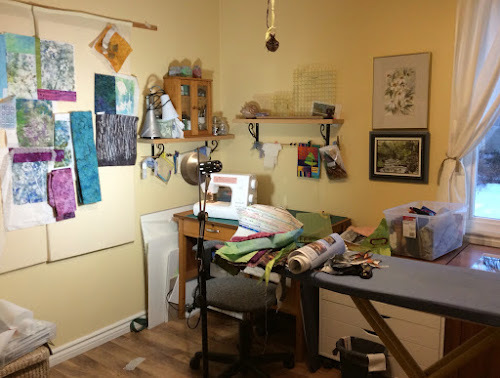 I really needed some studio time today. 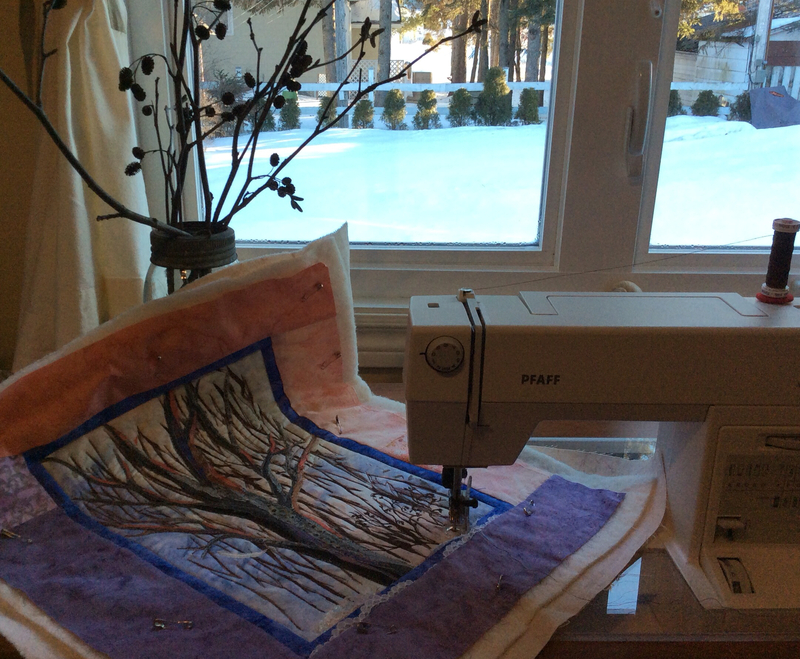 I gave myself two hours, making sure I alternated between standing, sewing and cutting. 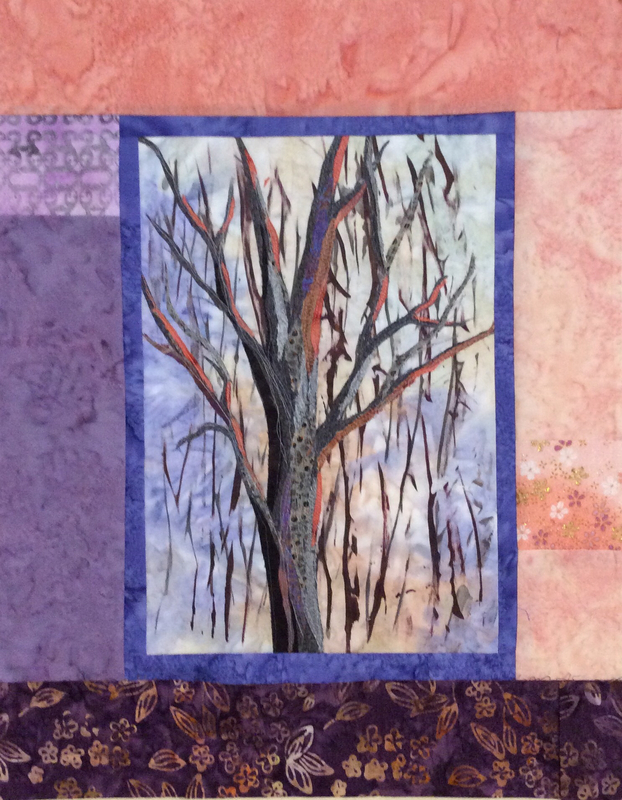 I've added a few more branches, a narrow border and I'm auditioning a final border. Taking a photo helps to see what I need to do. 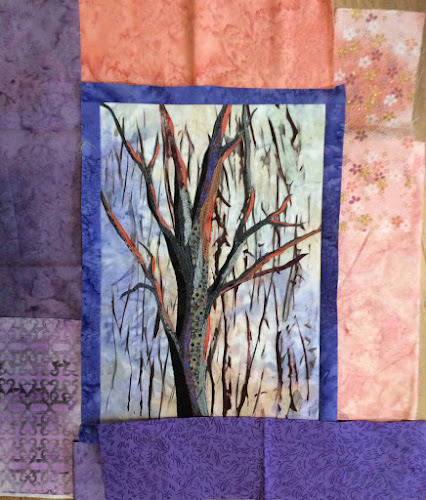 These are possible fabrics, but I'm not sure of the arrangement yet. 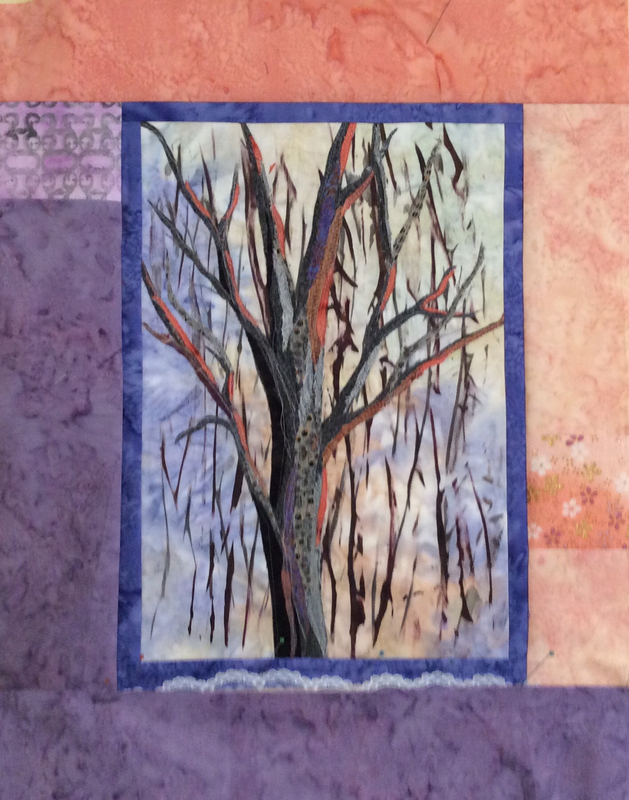 There is a bit more stitching left to do on the tree before I add the borders and get to the quilting. 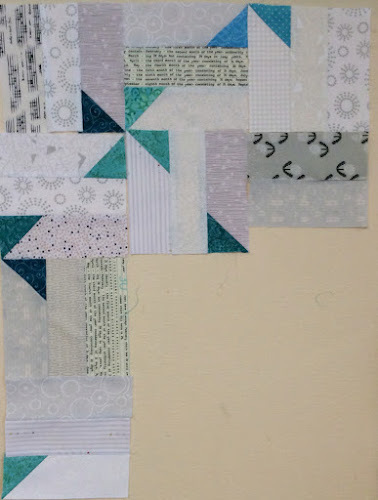 Then I switched to putting together a few blocks of a baby quilt I'm starting. 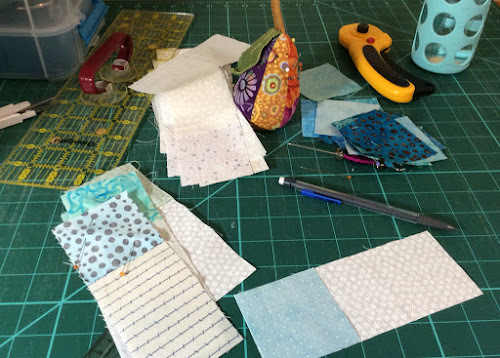 I'm using low volume prints plus various turquoise fabrics and following a pattern from a Fons and Porter magazine. 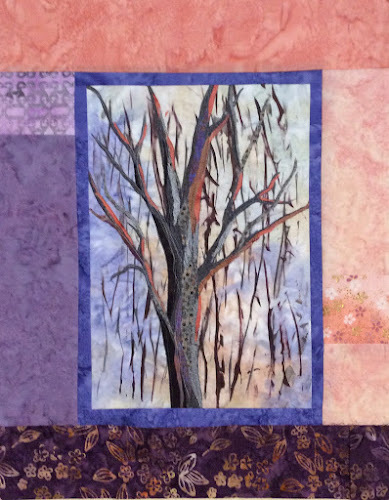 The quilt is actually larger; I thought it would make a sweet baby quilt. This is how I will be dividing my time in the next month. The baby blocks will be perfect for sewing days or for when I have a few minutes to sew.